The career of former Philadelphia Phillies hero Chase Utley may on the surface appear to be ending with more of a whimper than a bang. That is the case at least if you are counting his on-field contributions to the Los Angeles Dodgers in their latest postseason run. Dodgers manager Dave Roberts announced the team’s 25-man rosterfor the National League Championship Series today. Just as with the makeup of the team chosen to play during their 3-1 NLDS victory over the Atlanta Braves, Utley was not included. During the month of September as the Dodgers were fighting off the Colorado Rockies to capture their sixth straight NL West crown in a Game 163, Utley was given just two starts and played only one complete game. But despite not being on the field, the player known to Phillies fan as “The Man” continues to be a force behind the scenes and in the locker room for the Dodgers. “I had probably the best season of my career…I give most of the credit to Chase, because the work ethic that I created by being around him…If he doesn’t play ever again, he already played his last game of his career and here we are today, we got here at noon and we worked out like if he was active, like if he was ready to start a game tonight. So I’ll never be done saying thank you to Chase." Veteran outfielder Matt Kemp, a two-time NL Gold Glove Award winner, three-time National League All-Star, and the 2011 NL MVP runner-up, has sought out Utley for advice here in the postseason. Ten years ago tomorrow, on October 13, 2008, Utley slashed three hits at Dodger Stadium to help the Phillies defeat the Dodgers in Game Four of the NLCS. This was the famous game where Shane Victorino homered to tie it in the top of the eighth inning, and then Matt Stairs ripped one “into the night” as the Phillies rallied to a 7-5 victory and a 3-1 lead in the series. They would wrap it up two days later behind a Cole Hamels gem. Utley was in his prime then, a 29-year-old enjoying the fourth of five consecutive National League All-Star campaigns. 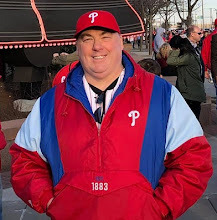 He was the best second baseman in the game helping lead his Phillies team to the franchise’ first World Series championship in nearly three decades. Now a 39-year-old who has announced that this will be his final season as an active player, he has been relegated to a behind-the-scenes mentoring role. But as he always did on the field, ‘The Man’ is still working hard, this time trying to end the Dodgers own three-decade World Series drought. Originally published at Phillies Nation as "Chase Utley again left off Dodgers postseason roster, but his impact on the team remains strong"